For the Colossus Grid Platform, Zerocoin will provide privacy and anonymity of transactions by ‘minting’ and ‘spending’ a set of pre-defined coin denominations. Zerocoin transactions are then verified by Zero-Knowledge Proofs. A vulnerability was discovered on the existing codebase which would enable an attacker to manipulate a zerocoin serial number causing another user to lose their zerocoin serial number validity — provided the attacker has control over user’s network. The COLX wallet design team reviewed and decided to uplift and tune the zerocoin codebase to resolve this vulnerability and add scalability to the requirements of the Grid. For the Colossus Grid Platform, two layers of privacy through Obfuscation will work in tandem. First level of transaction privacy will be managed by Zerocoin protocol (zCOLX) and the second level of user privacy will be managed by Armis (I2P) an anonymous network layer for a peer-to-peer connection. The I2P layer is integrated within the COLX wallet to build an encrypted network layer between Grid nodes and with the capability to store user data encrypted in the cloud. This integration will upgrade existing node communication to use I2P only once enabled. 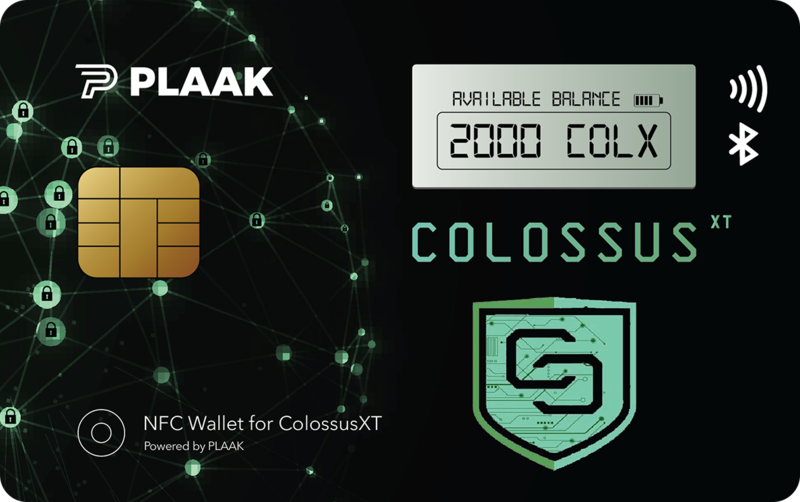 The ColossusXT Webwallet aka MyColxWallet is now active again. This web wallet can be used as on online or offline wallet for quick access to your coins. ColossusXT would recommends to use a Desktop or Mobile Wallet for holding a large number of coins. The ColossusXT Android wallet is affected by a sync-loop bug which causes Android wallet v1.2.1 to go into a blockchain sync loop everytime the app is closed on the device. The Colossus Blockchain is ever growing and the Blockchain Bootstrap is packaged for your in-wallet bootstrapping. After months of careful planning and execution, ColossusXT is now an officially registered business from Wyoming, USA. This is an important milestone in the evolution of ColossusXT in getting ready for the Colossus Grid as a Cloud platform. ColossusXT is proud to be issued with a Legal Opinion letter that certifies the genuinity and legality of the ColossusXT team. This now gives us immense strength and confidence to affirm to our community, partners and businesses on the vision and direction of ColossusXT moving forward. The Quarterly AMA for Q1 2019 has been released and live on Reddit. There are some very fascinating questions put forward which have been answered by none other than our PioyPioyPioy. We have now released the ColossusXT Twitter Faucet to the community. The most exciting marketing tool which is powered and run solely for the community. The faucet will reward any tweeter who tweets with the stated requirements and winning rewards upto 50COLX. Not a bad deal at all! ColossusXT is now part of Binance Info’s Trust and Transparency Initiative and awarded with the prestigious ‘V-label’. This V-Label award is proof of ColossusXT’s commitment to keep the community updated of project news and progress reports on a timely basis. ColossusXT Roadmap for 2019 is Live. 2019 is the year of COLX. ColossusXT team is determined to deliver much and beyond with the support of it’s trustful community. COLX is now partnered with MyCointainer which is a platform that manages your coins and earn rewards in return. COLX is now partnered with InnovaHost for a Masternode-as-a-Service. This platform enables new users to setup their masternodes for an attractive low monthly fee. CryptoWolf Trading is Now Live! CryptoWolf is a cross-chain non custodial next generation exchange platform. By utilizing ever evolving algorithms CryptoWolf has achieved the impossible; make an exchange directly at market price at almost no time. Avaiable with BTC/COLXETH/COLX LTC/COLX pairings. Cryptrade Trading is Now Live! Cryptrade is a decentralized cryptocurrency trading platform which provides traders secure and easy way to buy and sell cryptocurrencies and tokens online instantly. Available with BTC/COLX CRCO/COLX pairings.